Digital media and technology have become culturally and economically powerful parts of contemporary middle-class American childhoods. Immersed in various forms of digital media as well as mobile and Web-based technologies, young people today appear to develop knowledge and skills through participation in media. 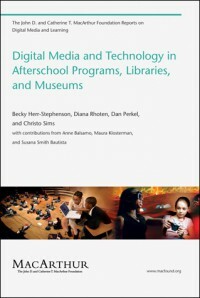 This MacArthur Report examines the ways in which afterschool programs, libraries, and museums use digital media to support extracurricular learning. It investigates how these three varieties of youth-serving organizations have incorporated technological infrastructure and digital practices into their programs; what types of participation and learning digital practices support; and how research in digital media and learning can contribute to better integration of technology within and across these organizations. The authors review a range of programs (including the long-running Computer Clubhouse movement, established in 1993 in partnership with MIT’s Media Lab), and then use the idea of “media ecologies” to investigate the role that digital media play (or could play) in these “intermediary spaces for learning.” They call for less anecdotal, more empirical and methodologically sound studies to help us understand the affordances of digital media for learning within and across these programs; for research focused on the relationship between digital media and the effectiveness of youth-serving organizations; and for further study of schools within childhood media ecologies. Becky Herr-Stephenson is a Research Fellow at the Joan Ganz Cooney Center at Sesame Workshop. Previously, she was a postdoctoral researcher with the Digital Media and Learning Hub at the University of California Humanities Research Institute. Diana Rhoten is Director of the Knowledge Institutions program and the Digital Media and Learning project at the Social Science Research Council and leader of the MacArthur Foundation–funded Learning Networks project in New York City. Dan Perkel is a doctoral candidate at UC Berkeley earning a degree in Information Management and Systems from the School of Information, with a Designated Emphasis in New Media from the Berkeley Center for New Media. Christo Sims is a doctoral candidate at UC Berkeley’s School of Information and a researcher for the Digital Media and Learning Hub at the University of California Humanities Research Institute.